Midori Precisions celebrated its 66th anniversary this year. We would like to tell the story of Midori Precisions’ 66-year history for a few times starting today. Midori Precisions is literally “MIDORI (緑)” which means the color of “Green”. I think that there are many people who would hear that the word Midori was being used for many companies and products in Japan but this was nothing related to us. In Japan, the word “MIDORI (green)” is strongly related to the new leaves of plants and it contains the image of New, Cleanliness, Reproduction, Peace, and so on. Mr. Kogure, the founder of Midori Precisions, had chosen Midori as the company name for containing the above meaning. 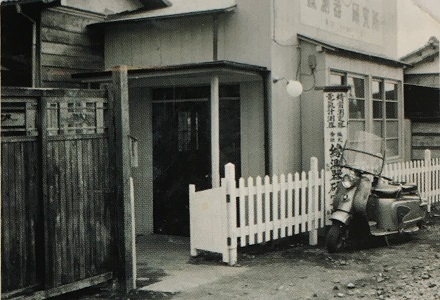 In the post-war era, Mr. Kogure who was researching and developing the aviation instruments decided to leave the company that he was working to start a new business by himself. After the war, it was an era of confusion in which common sense, lifestyle, education, and since almost everything had to be undergoing change completely for Japanese, many people were worried about their future but on the other hand, they may have believed in the unlimited potential of the future. Therefore, there was a log of people start new businesses by themselves in those days. When Mr. Kogure was considering the name for his company, several names were presented from a prestigious fortune teller who was introduced to him from his acquaintance and the name “MIDORI” was one of them. As he revived the memory of looking at the distant rich green hills seen under the wide blue sky from the war-damaged town when immediately after the war, and he strongly felt that the green hills were peaceful and beautiful and therefore chose “MIDORI” to be the company name without any further hesitation since the wish for peace has strongly been his wish for a long time and from that peaceful memory of those beautiful rich green hills. Thus, on July 11th, 1952, Midori Institute which was the former of Midori Precisions was established in Suginami, Tokyo, Japan.